We prefer to have documents sent to us in .pdf format, regardless of the program or file type that it may have been originally created in. If you send us your file as a word document (.doc), photoshop file (.psd), illustrator file (.ai), or any other program file, you run the risk of us not having the same fonts that you used. Our system will then just default Times New Roman for any font that we don't have. With a .pdf this is never an issue, since the font is carried inside the pdf so that anyone can open it and see it exactly the way it was meant to be seen. Files can also be sent in a .jpg, .gif, or .tif format, but it is important to make sure that the image is in a high enough resolution to be properly printed. How do I turn a file into a PDF? If you or your business has a copy of Adobe Acrobat Pro, you already have the tools to turn any document into a PDF! All you need to do is click print (Ctrl+P) in any program, choose Adobe PDF as your printer, then click print. 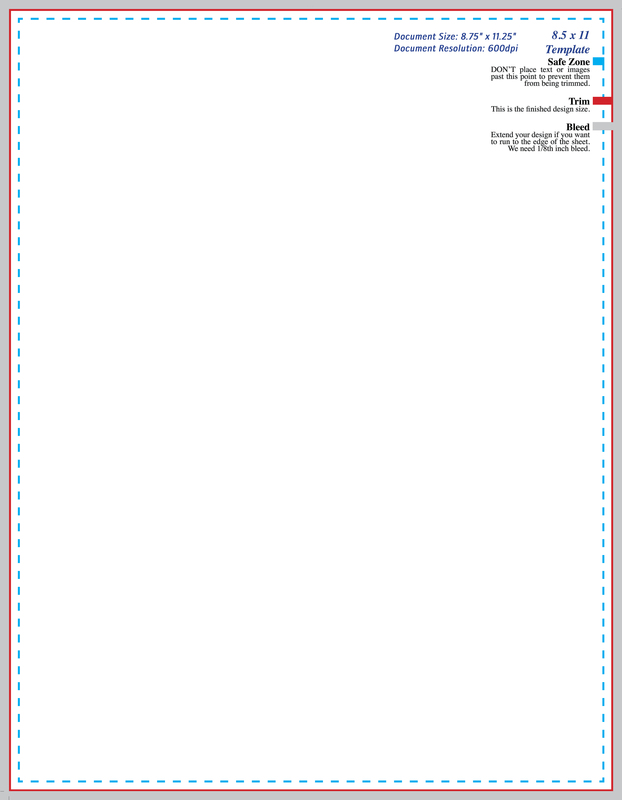 After a few moments, there will be a box that pops up asking you where you wish to save the new PDF. Save it somewhere you'll remember, then send it along our way. If you don't have Adobe Acrobat Pro, there are plenty of free PDF converters out on the internet. My favorite is CutePDF. It's completely quick, free, and easy to use. To make a PDF, follow the instructions above, but instead choose CutePDF as your printer. What is the best resolution for images? 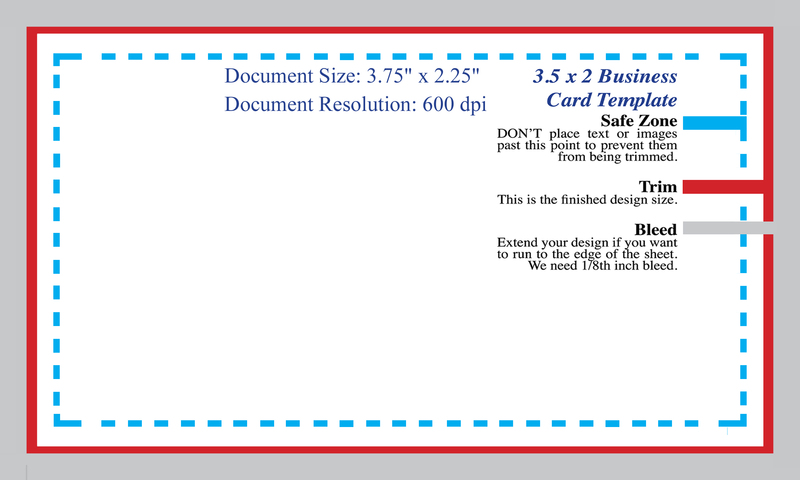 All images should be sent to us at at least 300 DPI (although 600 DPI is always preferred). DPI stands for Dots per Inch, so the more dots that there are per inch, the higher the DPI will be and the clearer the final product will print. It should be noted that a larger DPI will make the file size larger, but downloading this larger image will not be an issue for us. Most images created for use on the internet (Facebook, Flickr, etc.) at are saved at 72 DPI. This is the most common resolution that we are incorrectly sent, and if printed, it will look very blurry and pixelated. To check the resolution of your image (on Windows)... Right Click the image--> Click Properties (bottom)--> Click the Details Tab (top)--> Scroll down and look where it says vertical/horizontal resolution. Note: An image at a lower resolution cannot be made into a higher resolution. It's impossible to add detail to an existing image, however, detail can always be taken away. If your image resolution is too low, try getting in contact with the person who originally designed the image for you. Most likely, they have the higher quality file. What if my file is too big? If your email server says that your file is too big to send to us (most have a limit of 25mb or less), we suggest using a service called Dropbox. If you go to their website and create a free account, you can choose to share a folder or document with us (bbprinting@gmail.com). In fact, if you download Dropbox to your computer and share a folder with us, you can just move files on your computer to your shared Dropbox folder and it will show up on our computers in minutes! If you plan on being in touch with us often, this is a fast and easy way to share files. We ask that you be courteous though, since we are currently only sharing 3.8Gb with multiple people. YouSendIt and DropSend are both alternatives to sending large files, but neither is as intuitive. These services are more commonly used for one-time sending. How do I need to set up a file? For all products*, set up a file to have 1/4" more space both vertically and horizontally. For example, an 11" x 17" poster would need to be set up as a 11.25" x 17.25". 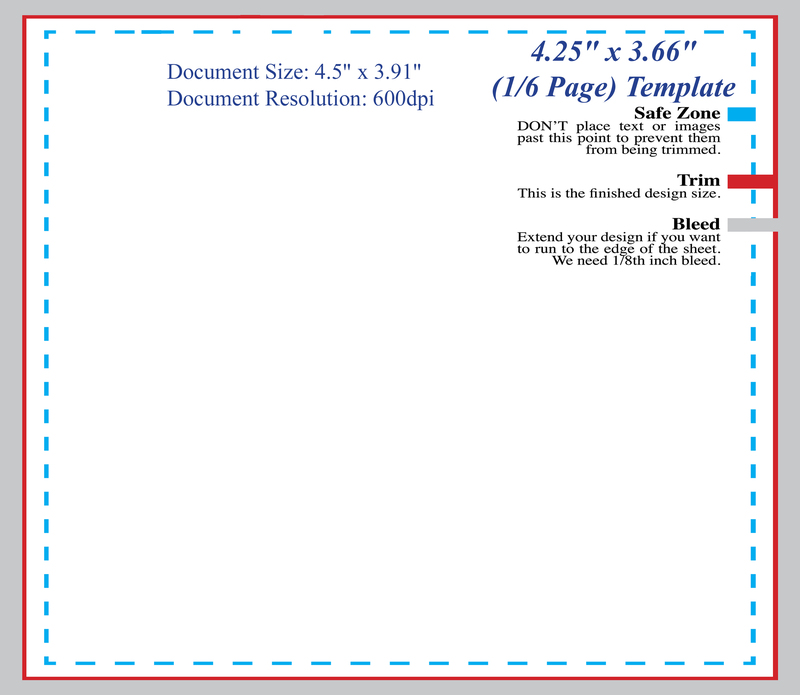 The file, when printed, will cut off 1/8" borders. This process is called "cutting to bleed". 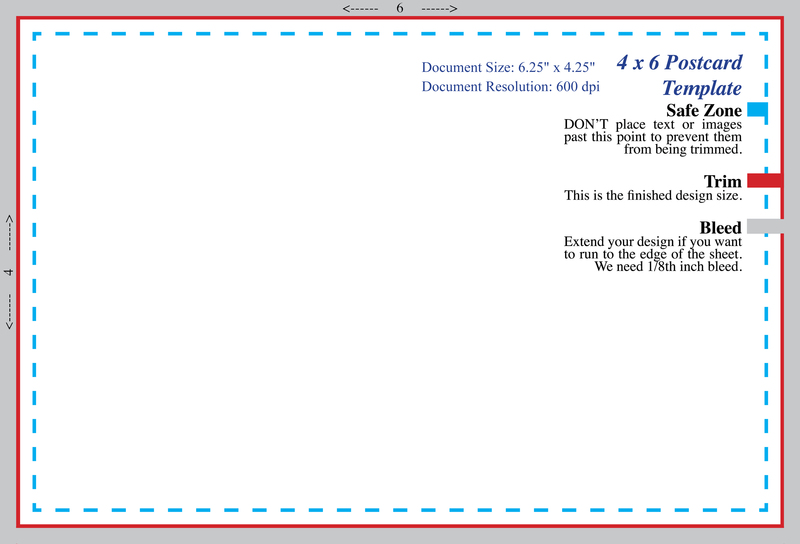 What this means is that the 1/8" border of the file is "bleeding" past where the actual cuts will be. (Basically, just make sure the background is extended.) Without giving us this bleed room, we cannot guarantee that a product will not have parts of an image or text cut off. For this reason, we ask that you keep images and text at least 1/4" away from edge of a file. This is the "Safe Zone" that ensures that they remain on the final product. While text and images getting cut off isn't a common problem, there are many close calls! A simple adjustment can make all the difference. *Note: There are slightly different set-up regulations for doorhangers. How do I design a file? There are many ways you can design a file. While some people manage to get by using Microsoft Word and Microsoft Publisher, we don't suggest these programs for product design. The most widely used software for image design is Adobe Photoshop. For many, this product is too expensive for the few times they would actually use it. If you're in need of a free alternative, we highly suggest using GIMP. Tutorials for both products can be found all across the web! If you aren't feeling up to designing something on your own, we can design your product for you! A design fee may be charged though, depending on how daunting the design task is. PC - Save these files to your hard drive by right clicking and pressing "Save Link As" or "Save Target As" (depending on your browser). Mac - Save these files to your hard drive by pressing Ctrl + Click and choose "Save As". 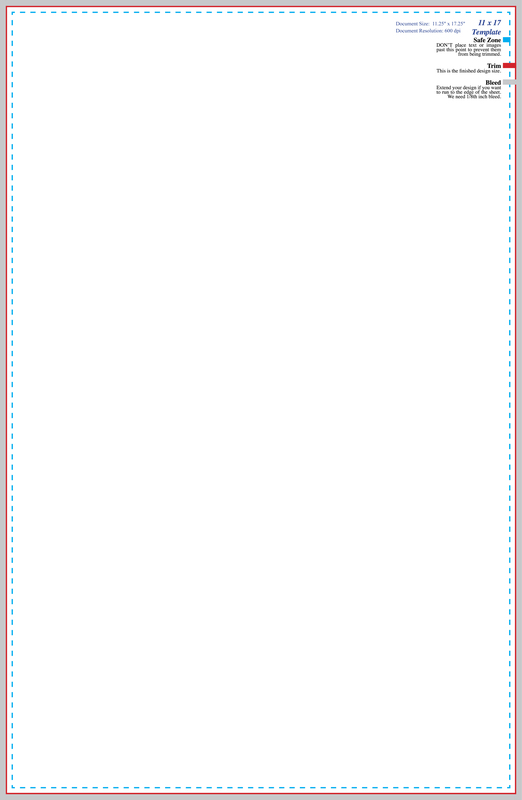 All templates have guide lines if opened into Adobe Photoshop. 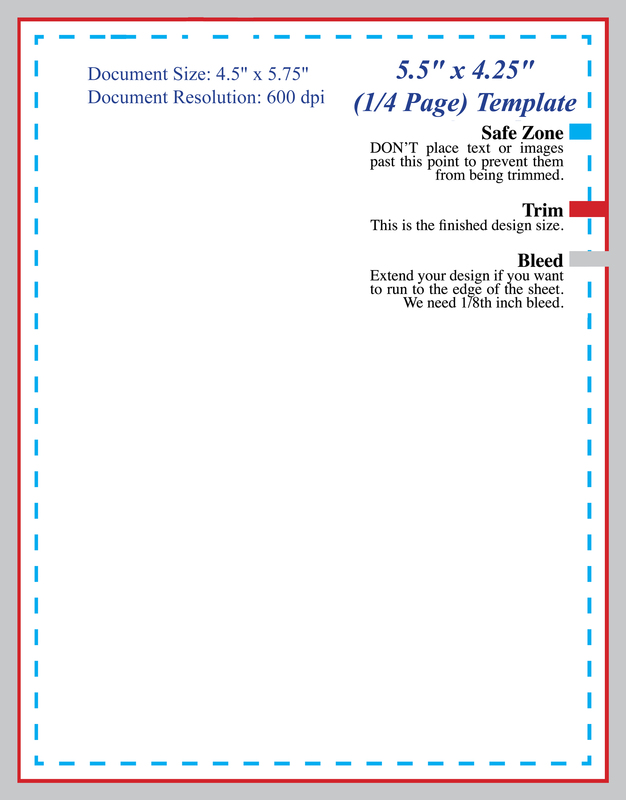 The templates visually show both the Bleed area and the Safe Zone. To effectively use a template, we suggest making it into a new translucent layer and start designing your product from there. You can turn the visibility of the template on and off to ensure that you are staying within the proper zones. Please be patient as we work to continually update this section to best help you out! 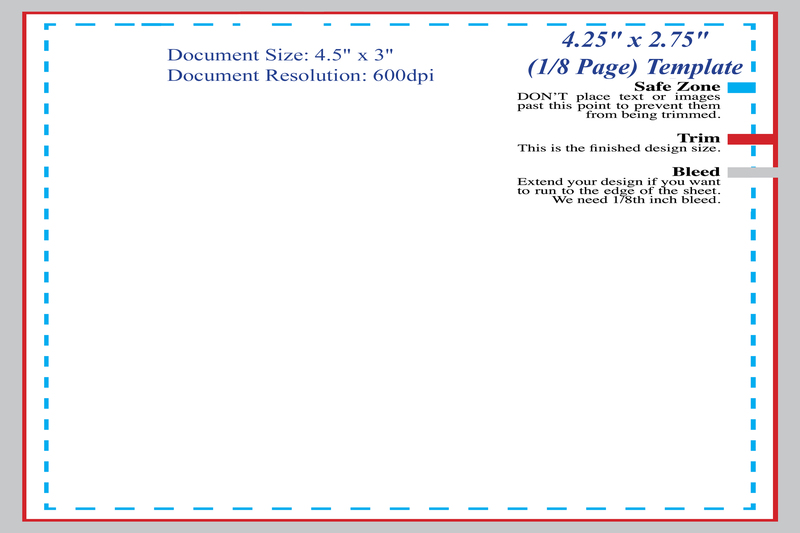 For all 4.25" x 11" doorhangers, set up a file that is 4.375" x 11.25". Due to the size, doorhangers will only have 1/16" bleed on the left and right sides. Please feel free to or email us or give us a call with any question you may have on exactly how to handle your files in the way that will allow them to print as clean and sharp as possible.